Born on 12th July 1825 in Horning, in Norfolk UK, Mordecau Cubitt Cooke received very little in the way of formal education, but living in the countryside andwith the help of personal tutoring in botany, languages and mathematics by an uncle, he soon acquired a broad interest in Nature. Thanks largely to great enthusiasm and a willingness to work hard, he achieved a great deal in his 89-year lifetime. After serving an apprenticeship in the drapery trade and spending some time as a lawyers clerk, Cooke became a schoolteacher in Lambeth until 1860, when he switched to a career in museums, spending the final 12 years of his official working life in the botany department of the Kew Gardens museum. Mordecai Cooke is the current naming authority for the lovely Amethyst Deceiver, Laccaria amethystina (W. Hudson) Cooke as well as for several other fungi. I believe that the earthtongue Geoglossum cookeanum may be named in his honour. Despite authoring many books (not all of which, unfortunately, turned out to be financially successful), Cooke struggled to make a living, and after his retirement it seems that he faded into near obscurity. He died in Southsea, Hampshire UK, on 12th November 1914. The abbreviation Cooke is used to indicate Mordecai Cubitt Cooke as the author when citing a botanical or mycological name. Cryptogamic Botanist, Kew Gardens Museum. Funded, in 1862, the Society of Amateur Botanists. 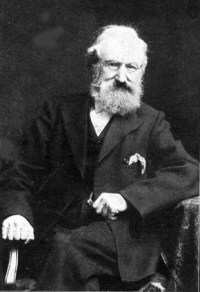 Co-founder in 1896 (with George Edward Massee, Carlton Rea, Charles Bagge Plowright and other eminent mycologists of the time) of the British Mycological Society. Awarded the Victoria Medal of Honour from the Royal Horticultural Society, 1902. Awarded the Linnean Medal by the Linnean Society of London, 1903. Awarded honorary Masters and Doctorates by various US universities including Yale. Mycographia, seu Icones fungorum (Mycographia, Comprising of Pictures of Fungi); 1857 - 1879. Rust, Smutt, Mildew, and Mould, 1865, with five subsequent editions the last of which was produced in 1897. Handbook of British Fungi; Miles Joseph Berkeley & Mordecai Cubitt Cooke, 1871. The fungi of Brazil, including those collected by J. W. H. Trail in 1874; ; in The Journal of the Linnean Society, Botany 15 p. 363; 1877. Fungi: their nature, influence, and uses; 1875 (plus five later editions in Cooke's lifetime, the last in 1894). Introduction to the Study of Fungi: their organography, - Classification, and distribution. For the use of collectors; 1895. Fungoid Pests of Cultivated Plants; 1906. Reproductions of many of Mordecai Cooke's books are still in print and are widely available. Brief Biographies of British Mycologists; Geoffrey C. Ainsworth (Edited by John Webster and David Moore); BMS 1996. Dr, M C Cooke (obituary) in Nature, 94, pp315-316, 19th November 2014.